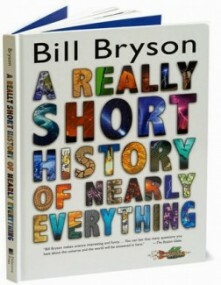 Bill Bryson’s A Short History of Nearly Everything is probably the best non-fiction book I’ve ever read. In fact, it’s probably the best one ever written. The sheer amount of information in it is utterly staggering. It is so well researched that when I hit 69% on my Kindle, I’d reached the last page. Where the hell’s the other 31%? Bibliography and notes take up the remaining pages. That’s a lot of trips to the library. Even more shocking is the fact that Bryson manages to make it so much fun to read. That’s hard to do when your topics cover some easily mishandled topics like genetics or paleontology. I picked up the beautiful hard copy, illustrated edition after reading it on my Kindle. That’s often the litmus test for me these days. If I want to own it as a physical book, if I want to display it in my library, then it’s good, really good. The fact is I don’t buy many real books these days. Ten years ago that was unthinkable but today I’d rather just download it than lug around a wide format, color illustrated brick in my bag. I ordered the physical book the day after finishing it. I’ll probably read it again, because it’s filled with some amazing and beautiful illustrations that weren’t in the e-reader edition. So what’s it all about? The book tries to answer the biggest questions in life. What’s the meaning of it? Why are we even here in the first place? Where did we come from? The answers are often profound, funny and entertaining all at the same time. The author travels the world relentlessly looking for answers from the foremost experts of our time. The book takes you from the first picoseconds of the Big Bang to the furious rise of modern civilization. It covers how we figured things out, what we know, and how we’ve learned it. It also peels back the covers on the lives of all the people who figured out all the amazing things we’ve learned over millions of years. Who were they, what were they like? It also doesn’t hesitate to cover the massive gaps in our knowledge, all those things that we just have no idea about like what happens if we keep killing off other species at such an accelerated rate? We just have no idea and we probably don’t want to find out because the answer will likely not to be good. At times it feels like almost every page is packed with mind bogglingly amazing facts. You’ll find yourself talking out loud saying “no way that’s true,” or “oh my God, really?” There were at least a hundred moments where I had to put the book down and quietly reflect on what I’d just read. Whether it was a moment that shows the incredible miracle of life in a way you’ve never seen before or whether it shows humans at their most vicious and ignorant, it’s heavy stuff. You’ll find yourself with an abundance of new Jeopardy wisdom after reading it. For instance, you’ll now know that all of the ancient human bones we’ve ever found would fit in the back of a pickup truck. You’ve probably never even seen a real fossil, even if you have been to the natural history museum with your kids. You saw a bunch of recreations. They’re just too precious to put on display. At times the book will inspire you, like when you realize that you and every other person you’ve ever met or will meet is literally related to the Buddha and Christ and Alexander the Great because you carry billions of their atoms. Atoms move around all the time. Of course, it takes a little bit for those atoms to shuffle off to new jobs, so you’re not related to Elvis or JFK just yet, but your great grandchildren will be sporting the atoms of the kings and queens and rock stars that you idolized. The book will terrify you as well. If you’re a person of conscious and empathy, it might even lead you to despair and an occasional tear. Right after you realize just how miraculous life is, how many trillions upon trillions of factors and variables have to align absolutely perfectly so life can exist, you’ll get hit with how fragile that balance can be. Take E.L.E’s for example, aka Extinction Level Events. We’ve had no fewer than four major extinction events in human history, which wiped out between 70% and 90% of all life on Earth for millions and millions of years. That’s not to mention the minor ones and the ones we don’t know about. We like to think we are the pinnacle of evolution, but in the lifespan of the Earth we’ve barely been around a few seconds. If you stretched out your arms, and the entire Earth’s history was the distance between your fingertips, you could wipe out all of human history with one single flick of a nail file. We just haven’t been around that long, maybe 5 million years. Sounds like a lot, until you realize that compared to other creatures like the Trilobites, that ruled the Earth for an amazing 270 million years, over 250 million years ago, we’re nothing but a miniscule little upstart of a species with a long way to go. We’ve got a hell of a long way to go to prove we are the true masters of the universe, when the simple Trilobite has a good 265 million on us. Environmentalists will have you believe that the Earth is in danger, but I came away feeling that the Earth isn’t in danger; we are. When we destroy the environment, it will recover. It will reset. It will do that by killing us all off and evolving a creature that is better suited to caring for the things around it. It will develop one that is less careless and stupid. It will create creatures with deeper empathy and compassion and understanding to match their fearsome aggressiveness. In other words, it will create more balanced creatures. And if one part of that new species finds a way around the safeguards the Earth builds-in to keep them balanced, evolving heightened aggressiveness with weaker empathy, so that it takes over and wipes out its more balanced kin, then the Earth will start all over again one day. It’s in no real hurry. It’s got all the time in the world. It can see how its’ investments play out in the long game, the real long game. For a time that violent species will strut around the Earth, convinced that it is the pinnacle of everything that ever was and then one day they will wake up to a sudden cold front that stretches out for a 1000 years or a volcanic eruption so big that it explodes with the force of a 100 billion Hiroshima’s and blankets the sky in a dark fog that never recedes for 10 million years. 10 million years is nothing to the Earth. It’s like a day in your life. It can wait. It is patient. There are some idiots who think guns and video games and movies made us violent. That’s an absurd joke, a political magician’s sleight of hand and misdirection. We’ve always been violent. We’ve always been a cruel, violent, ignorant species. Occasionally a lone genius rises from the primordial ooze and helps advance civilization just one tiny little step forward. At other times, we collectively wake up and realize that all black people should not be treated like cattle or that the Jews are not poisoning the wells to spread the plague or that we probably shouldn’t torture people because they express a different point of view (well we’re still working on that one in a few spots). Of course, in almost every case of the long geniuses, the idiots that surround them on all sides ridicule them, ignore them and beat them down to the point that they quit and never do anything to help their fellow man again. Take Gregor Mendel. You read about him in high school. He was a monk who figured out how genetic traits are passed with eight years of rigorous experiments. They were so rigorous that few people understood them during his lifetime and so he was ignored. Eventually, he was so frustrated shouting into the void that he gave up science and lived a quiet life as a monk, eventually rising to become Abbot of his monastery. Just think how much more he could have done if the morons that surrounded him didn’t exist? Despite all that, I found myself not worrying too much. So Yellowstone National Park is in fact a massive supervolcano (turns out most really dangerous volcanoes are underground). It erupted not too long after human beings showed up on the scene, killing off most of our early kin, but it’s out of that ash that the first life rose again. The rich volcanic soil, left behind by cataclysmic eruptions that destroyed everything the Dinosaurs and the Trilobites ever knew or loved, is filled with some of the most nutrient dense and wonderful soil you can find here or anywhere. Life is incredibly resilient. The cycle of life moves forward relentlessly. It’s only because we cling to life’s present form, that of the human being and their tiny opposable thumb; resulting in our failure to appreciate life in its infinite forms. The first flowers bloom from the very spot where everything died. And whatever life creates next, your atoms will help drive that new world, hitching a ride on whatever new species rises to inherit the Earth, dreaming of bigger things to come. You may not live forever, but the stuff you’re made of is immortal.